Renee Rouleau Bio Repair Masque Review (2019): Is It Worth Buying? Renee Rouleau Bio Repair Masque instantly relaxes and reduces skin redness to calm the skin. This formula has a cooling effect that gives intense nourishment to the skin while restoring the balance of the skin chemistry. This face masque helps diminish symptoms of rosacea and helps hydrate the skin. This also soothes the skin after basking under the sun. This masque is available at their official website at $49.50 for every 60ml tube. This Renee Rouleau Bio Repair Masque Review will help you decide if this product is the right one for your skin type. About Renee Rouleau Bio Repair Masque – Does It Really Work? Renee Rouleau is a renowned trusted esthetician by celebrities and other famous media icons. With her 25 years of experience, she has found out that there is no one solution for every skin type. With this in mind, she formulated customized skincare products suited for each skin type. Today, they have 9 different product lines that address 9 different types of skin condition. Soothes and quells skin redness after exposure to the sun or harsh environment. Relief from dryness and flaking. Using this mask will calm the skin and reduce inflammation, redness, and irritation. What Are The Ingredients In Renee Rouleau Bio Repair Masque? Oat Kernel Extract: This ingredient instantly comforts the skin and give relief. Bisabolol: This plant-derived ingredient is an effective anti-irritant that reduces skin inflammation and redness. Chamomilla Recutita Flower Oil: This oil calms and helps to repair the skin cells to restore your beautiful glow. 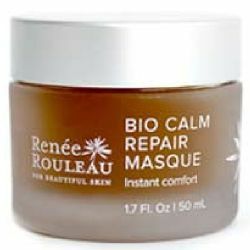 Using Renee Rouleau Bio Calm Repair Masque is relatively easy. To calm the skin from irritation or rosacea symptoms, spread this masque thinly on cleansed face. Leave it on for at least 15 minutes and rinse thoroughly. Use your favorite serum after for best results. To double the cooling effect, refrigerate this mask before using. The manufacturer states that you can use this as often as you feel the need. This masque instantly calms the and relaxes the skin. It helps reduce skin inflammation and give moisture to the skin to help in the growth and repair of cells. This masque is expensive for the quality and benefits it offers. Not many information can be gathered online about this product. Some user reviews expressed dissatisfaction about this masque. They have not published a full list of ingredients so you could check for allergenic substances. Does Renee Rouleau Bio Repair Masque Have Any Side-Effects? This masque is made with oats. If you have gluten allergy, you may want to steer away from this as this may cause itching, rashes, or other worse skin condition. Renee Rouleau Bio Repair Masque is a famous brand that celebrities prefer. Some icons have enjoyed using this mask and have found it effective in calming their skin. However, this product lacks some necessary information online to persuade you to make a purchase. The absence of the ingredient list can make it difficult to decide whether to get it or not because of some allergy considerations. Also, it has a high price tag for a relatively low quantity.